Maybe I have a romantic idealism about our neighbors to the north, but I really like Canada. It could be our family camping trips there when I was a kid – yeah I’ve been to Penticton, pretty cool right? – the awesome Maple Leaf flag, all those Dudley Do-Right cartoons I watched, or Shane Koyczan’s impressive spoken-word performance at the Vancouver 2010 Olympic Winter Games opening ceremonies. Whatever it is, I’m hooked. 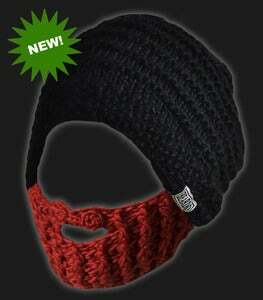 The Beard Hat – You Know You Want One! But here’s something even more impressive. A team of 18-20 year olds wanted to play in a hockey tournament but the timing was bad, coinciding with exams at school. So the players told the coach they couldn’t go unless the trip included study time. The coach agreed and notified the league that the players would miss the opening and closing ceremonies because they had to study. After the tournament finished, the league told the coach he made the wrong choice (all players had to be present at all functions according to the tournament manual) and banned him from coaching for a full year. Then it fined him $2000. He’s a volunteer coach. $2000 and a year in exile for making a choice that he informed them about ahead of time. Thanks for all your hard work, Coach; no we couldn’t have told you beforehand that the players weren’t allowed to skip the ceremonies. From what little we can see of the coach in that article, I would bet he’d make the same choice if given the opportunity again. This is a coach who puts his players first, who answers to a higher sense of sportsmanship than that shown by the league. This is a coach who reminds me of Peter and John. In Acts 3 John and Peter performed a miracle, healing a man who had not walked in years. The amazed crowd asked how this happened and Peter answered with a phenomenal sermon on the Good News of Jesus Christ. The authorities were not pleased. Doing what’s right because it’s right. Not following orders, because those orders violate a higher principle. Where have you seen this lately? [10,000 interwebz, useful for absolutely nothing, to everyone who can identify the source of the following verse without the use of the internet. 20,000 interwebz to everyone who uses the internet to do so. This entry was posted in Uncategorized and tagged Canada, thanksgiving, trusting God. Bookmark the permalink. 9 Responses to Happy Thanksgiving, Canada! I remember this article, Tim. It’s a rare and valuable find when someone takes a stand like this. Part of me wants to say, “these days,” but your example from Scripture shows that isn’t the case. It has always been a difficult thing to do, which is why it is so valuable and admirable. This kind of fortitude is what we need to look for in leadership: someone who is willing to take the lumps for the right thing. I always tell my kids that there are consequences not only for bad decisions, but good ones too. Too often, we think that doing the right thing, or good decision making, will be followed with immediate blessings. But are we willing to do the right thing when the blessings don’t look the way we think they should? Consequences for the good and the bad choices we make – that’s a valuable lesson for out kids, and one that is found over and over in Scripture as well as in the world around us. That Canadian coach really did set a fine example for the kids on his team and for their parents as well. On behalf of the entire country, thanks for the Thanksgiving wishes, eh? Did you recognize which of your countrymen penned those lines at the end of the post, Jeannie? It’s Doonesbury, right? — but I didn’t know Gary Trudeau was Canadian (?). Maybe he’s related to our former PM Pierre Trudeau! Well, Garry was born in New York but he does have French Canadian ancestry from what I’ve read, so perhaps I should have said he’s a distantly related fellow countryman of yours. Cool: we’ll take him, then! Years ago I went to the Stratford Ontario Theatre Festival. Great trip, wonderful place. Had some memorable scones for breakfast one morning. 8-9 Would LOVE to visit Canada again. Happy Thanksgiving to our neighbors in the north! That sounds like a wonderful trip, MA. Canada is a magical place!